Join me as I blind taste test some local wines from Maryland, Pennsylvania, and Virginia! 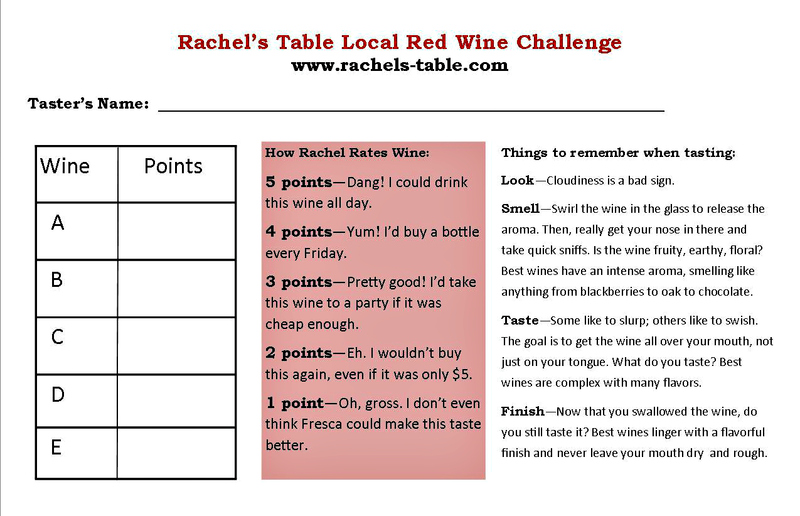 If you’d like to conduct your own Local Red Wine Challenge with friends, feel free to use the classy rating method below, meticulously researched and painstakingly crafted by yours truly. I’m off to finish off those bottles! Cheers! P.S. – Any ‘stache you saw in the vlog supports Bloggers for Movember. Go donate! Great vid – entertaining with a host that’s easy on the eyes! A wine blogger I followed just posted about the soon-to-happen demise of Chaddsford. It’s an good read – http://thedrunkencyclist.wordpress.com/2012/11/05/death-of-a-winery/. He also did a post on Tasting Notes where he says the “experts” are really getting out of hand. Your scoring are probably just as useful to the general public and a heckuva lot easier to understand. If you’re looking for a good Virginia wine, I dropped a lot of money at Williamsburg Winery a couple years ago. Was really pleasantly surprised at high quality and craftsmanship. I read the drunken cyclists post, and we agree on Chaddsford sweet wines. YUCK! They taste like watermelon jolly ranchers. Sad to see them change hands and ramp up production on the sweet wines, but I’m not surprised. I can only find the sweet wines at the liquor stores near me. I had to go out of my way to track down the red I tried. I’m please you found my rating system “useful.” It should be, at least for the novice wine drinker. I’m not a fan of experts over-complicating something that should be enjoyable. I’ve heard SO MANY good things about Williamsburg Winery. I’ll have to make a trip down there soon. Oh Nicole, you get me. Our faces will enjoy some wine at happy hour this week! And I would have gladly allowed you to hold my spittoon. haha. Ahem, you’re not going to beat Cali with wines from Maryland, Virginia and Pennsylvania. 😉 (France can’t even beat us anymore.) But y’all grow some mean, uh… raspberries. Well…obviously…but I thought I’d try. I’ll never drink anything but California again. Lesson learned. Were those ‘staches on the GLASSES, too?! Amazing. I burst out laughing when Angie made a cameo. And at the ‘face’ method. You are MADE for vlogging! Also? I so appreciate what you said about it being fun and “if you like it, you like it”! Amen! Can we use this rating system on Saturday? For beer? P.S. – Pardon me while I geek out, but how did you get the video to speed up?!?! I was trying to do that exact same thing for my fitted sheet vid using iMovie, and I could NOT figure out how to do it!!! The music was perfect, too. YES! Mustache “wine charms.” Cute, right? I am definitely not a wine snob. If it’s red, I’ll drink it. If it’s white, I’ll drink it. If it’s in a box, I’ll drink it. If it’s bad, I’ll drink it after I pour fresca in it. Oooooh we’ll have to come up with our very own beer rating system! But we have to drink a lot of beer FIRST. It’s happening! Same here re: wine! I just remembered I forgot to say – we love Ravenswood, too! Wine drinker friends of ours recommended it a long time ago, and you can’t go wrong with any of their reds. I’m brainstorming about our rating system. But I might be too drunk to remember it tomorrow. We’ll come up with something fantastic. I’m sure our two drunk brains are just as good as any one normal brain, right? Thanks, Julia! I’m so glad you took the time to comment! Wine Guerrilla only makes Zinfandels. I’ve tried two of them and they are both excellent! They have a website – http://www.wineguerrilla.com. This cracked me up! I have a soft spot for California Zins as well… If you’re looking for something a little more local than CA, check out some wines from the Finger Lakes, they have come such a long way! Thanks Noelle! I wonder if I can get Finger Lakes around here. I was shocked with my love for CA zins. I think it’s all I’ll be drinking for some time. You should be able to, if not in Delaware, then maybe PA or MD… and if you’re looking for a good California Zin, try Earthquake Zin (by the Lodi Bros.)… but be careful because it has quite a kick to it! 7 Deadly Zins is also very good. This was perfect. Great vlog abilities, you’re so relaxed and smooth and funny. Sometimes I find the ‘cheaper’ wines are much better. I never get tired of talking about wine, or drinking wine….And I loved the ‘stache glasses and ‘stache eyeglasses (hard to drink with those on, I imagine!) I cracked up with Angie’s photo. Thank you! Smooth? I’ll take it! I thought I could drink with the ‘stache glasses! But the plastic ‘stache gets in the way of wine consumption. Not cool. Oh and Angie steals the show as always!! 1987-Angie does steal the show! 2012-Angie backs into a dimly lit corner and hopes no one has noticed she’s arrived. I don’t believe that, Angie. I’ve seen you in a striped sweater. Still a star! I’m with you. Usually if it’s wine and red, I’m happy. Yesterday I went on a brewery tour with Jules (don’t be jealous) so I was happy if it was beer and a shade of amber. Funny! I like your video and could adopt your rating system! You need your own show, Rachel! Or maybe your own YouTube channel. I love Ravenswood! Thanks for validating for me that it’s actually good wine and that I’m not just choosing it for the pretty logo design. Love the mustache incorporation in here. I wonder if having a mustache allows you to enjoy wine more? Perhaps it absorbs the vino fragrance. There’s that awkward girl again. Wow, she has a mustache now — she’s growing up so fast. Haha! She IS growing up so fast. Her hormones are wreaking havoc on her face already. I thought I discovered something new with ravenswood but so many people have told me they love it. If I ever had my own show you’d have to get royalties or something because you would show up a lot. Do you regret sending me that photo? Definitely don’t regret sending it. By sending it off to you, I feel like I somehow freed the evil spirits that once possessed me…in the form of crimped hair.